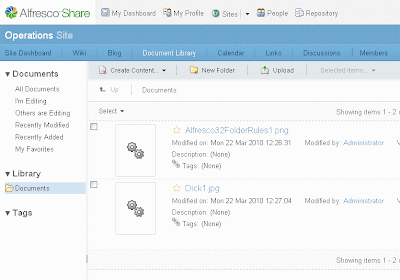 One great thing about Alfresco Share is (was) the ability to automatically create thumbnails for documents on upload. Being able to visually browse your documents before opening them is a feature that many people like. It can help you locate the document more quickly and helps to distinguish document contents in the case where documents are similarly named. The problem is that on Windows in Alfresco Enterprise 3.2r, this feature broke. On upload of a document, Alfresco tries to generate the thumbnail for the image content, but fails and instead creates a zero-byte thumbnail file. You'll see something like this. The default picture of a pair of gears displays whenever Share doesn't have a valid thumbnail file to display. Searching in the forums for a possible solution, I came across one posted by Nicola Prando. The bug and solution are also posted as ALF-1978. Thanks Nicola! After doing that, thumbnails will get correctly created.